Well, it's that time of year again. 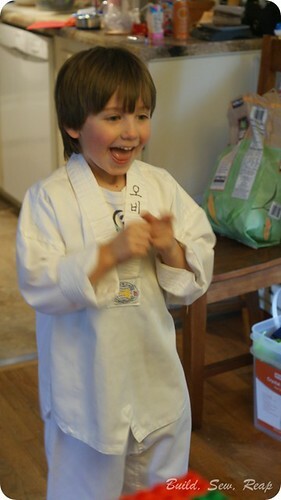 My big kid just had his birthday and although I tried *really* hard to tone it down a bit, I think I failed. We did manage to keep the guest list to a reasonably sized group of kids his own age and family but we still went a little nuts with decorations. I'll take you through it from start to finish and hope that it inspires you to take on some fun Star Wars Lego projects of your own. If you've looked at ideas around Pinterest at all, you've probably seen this type of invitation. It wasn't an original idea but I gave it a few of my own touches. Since I don't have fancy-pants photo editing software, I found it was easiest to type the text in MS Word then use word art to stretch and skew it to give it the look that it was flying away through space. 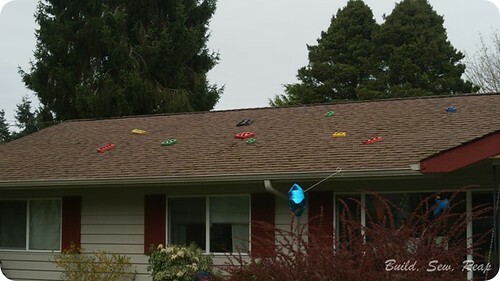 As our guests approached the house, the first thing they saw was that there were giant Legos on the roof. I used scrap wood (mostly 2x4s) and a sliced up wood dowel to create the Lego look. 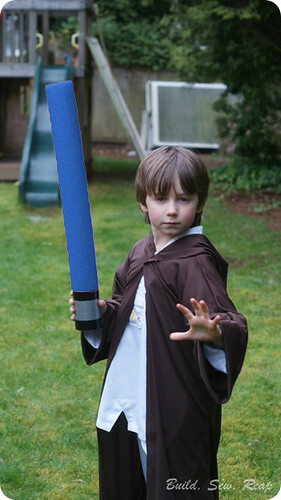 Each kiddo was handed a pool-noodle lightsaber and they immediately jumped into an epic battle. I think those kids beat one another for at least 30 minutes. 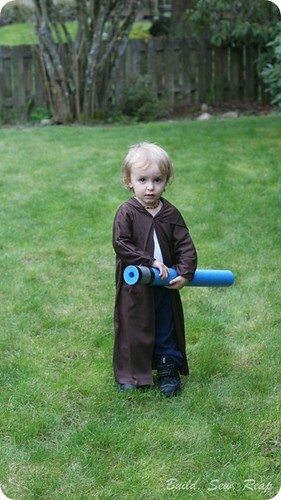 This little Padawan was a little more hesitant to jump into battle. 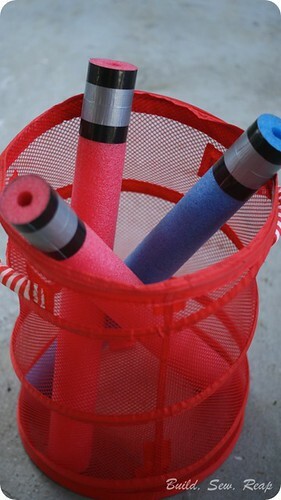 Once they worked out their aggression, we handed out bubble wands. 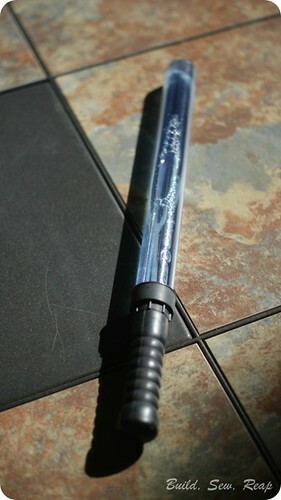 I bought bubble wands and spray painted the handles with cheap $.99 spray paint from Home Depot. It worked out great. If I had it to do over again though, I might have shoved a few glow sticks in each one. 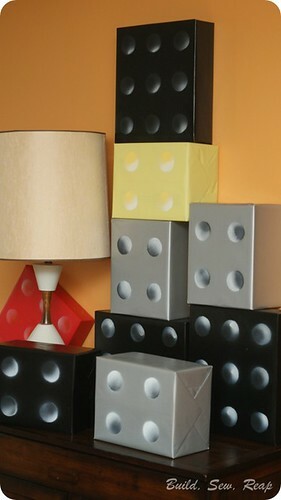 Inside the house, there were around 75 giant legos made by wrapping boxes in black, silver, yellow, and red wrapping paper then spray painting using a stencil (and some previously undiscovered graffiti skills) to make them look like big legos. I thought about doing an activity with them but decided against it at the last minute. 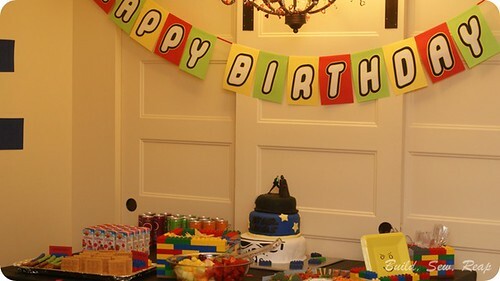 I made a bunting using half sheets of brightly colored copy paper and letters that I printed out on my computer then cut out by hand. I used a Lego font I downloaded for free online (please forgive me, I have no idea where I found it). 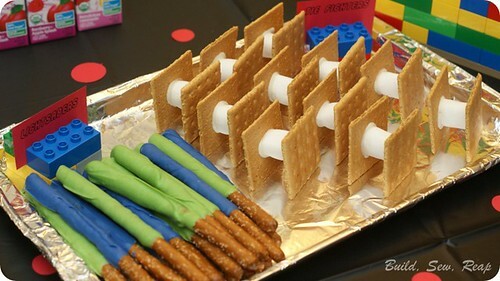 I made candy-coated pretzel rod Lightsabers and graham cracker, vegan marshmallow, and candy melts (to stick the marshmallows to the graham crackers) Tie Fighters. All food also featured labels held up by Lego Duplos. 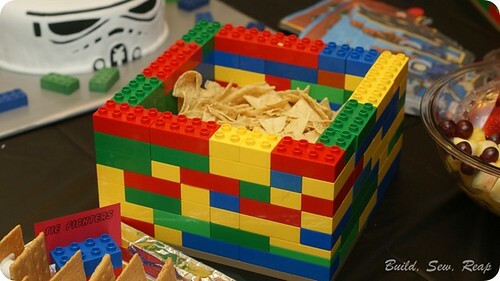 At the birthday boy's suggestion, he built a chip bowl out of Duplos as well. 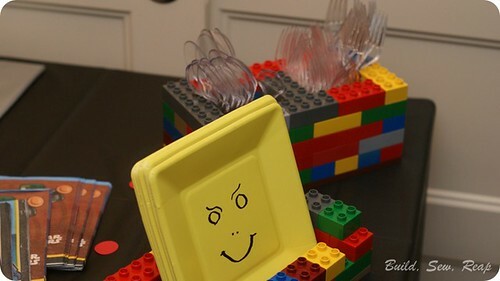 My mom put together this crafty little silverware holder and my dad drew Lego man faces onto yellow Dollar Tree paper plates which were also supported by a structure my mom built. As I do every year, I created an elaborate cake. Yes, it's far more elaborate than needed for a 6 year old's birthday and featured way more cake than was necessary but I don't have a lot of opportunities to create cakes so I just go all out and over the top when the occasion arrises. The top layer was a cane-sugar free vegan chocolate cake made from scratch. The middle layer was a gluten free cake made from a mix and the big layer on the bottom was a vegan yellow cake that, quite frankly, didn't turn out so great. The kids didn't mind though. 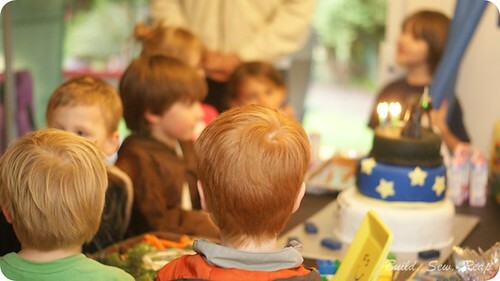 He loved his party more than I could have hoped for. 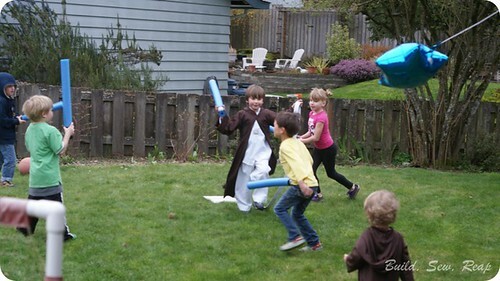 My husband designed and lead the kiddos on a Jedi training obstacle course in the back yard, we had a piñata full of legos, there was an area for free-building with a HUGE tub of Legos to pull from and lots of happy kids running all around. 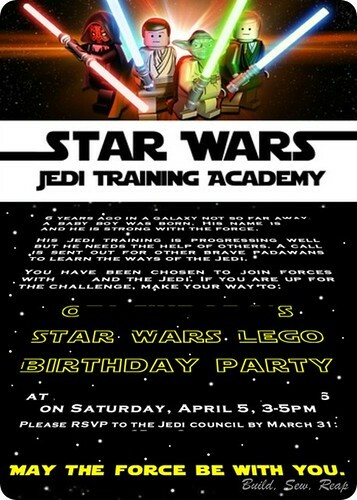 This Star Wars Lego 6th Birthday Party was such a blast. Thanks for sharing photos. I would like to use some ideas from these pictures. Actually my son’s birthday is coming. 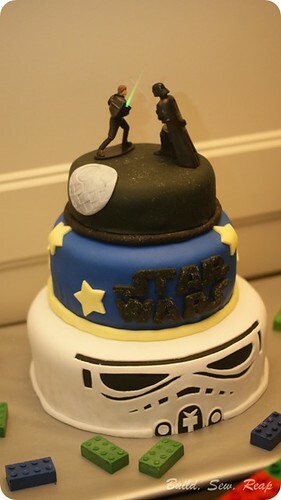 I am thinking to use such a theme for celebrations. Could you share recommendations for party venues in San Francisco?